The LG G2 is probably everything you could possibly want an Android smartphone to be, at least purely in terms of hardware. It has a large, high-definition display. Its internals, camera and battery life promise to be pretty amazing compared to its competition. Yet, it doesn't leap out at us or cause any stir or excitement. We like the G2, except it's a safe phone, as mentioned in our early verdict of the device. Prior to the event, we thought of it as a Galaxy S4 clone, and it turns out we weren't the only ones who felt that way. The only radical part of the device is where the power and volume buttons were placed - on the back. LG's decision to place the volume and power buttons just underneath the camera has us questioning its direction. LG told us over and over again during its presentation that the company is listening to its customers and observing their behavior, hence the odd design. It turns out that it's a little awkward to interface with the phone that way. While many of us do keep our index fingers right around where the camera is when we're on a call, it's not the only time we're having to adjust volume. When we're watching videos or listening to music, it could be awkward reaching behind the phone and feeling around for the volume keys. 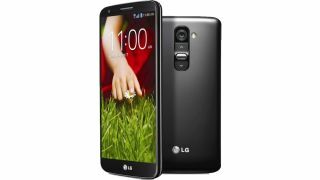 Perhaps we're nitpicking, but when LG's highlights were its weird button placements, boys choir ringtones and 192KHz audio, we're left wondering whether the LG G2 is going to steal any thunder from the HTC One or Samsung Galaxy S4. At one point during the launch event, we felt like LG was trying to out-Samsung Samsung in the stuff-it-with-features department. Like artists do with their work, Samsung and HTC have made their visions and styles very clear. It's easy to spot an Android device designed by either company, even if it's a leaked photo of an unreleased device. We're hoping that the LG G2 is a small step in a new direction for some kind of vision for the Korean manufacturer. While we like its phones, like the Optimus G and the Optimus G Pro, we find no real reason to pick up an LG phone over Samsung or HTC. Stay tuned for our full and thorough review of the device. Our early predictions tell us it's going to perform well, and that the G2 is going to be a winner by any standard we can give to smartphones. However, this nagging feeling about its lack of soul or style still lingers, and we wonder whether LG should take bigger risks with its next flagship Android device.